Ivy Tech Community College’s Bloomington campus opened in 2002 and serves approximately 10,000 students annually. Counties of service include Brown, Greene, Lawrence, Martin, Monroe, Morgan, Orange and Owen. Though Ivy Tech Bloomington has an eight-county service area, the campus serves students from nearly all of Indiana. 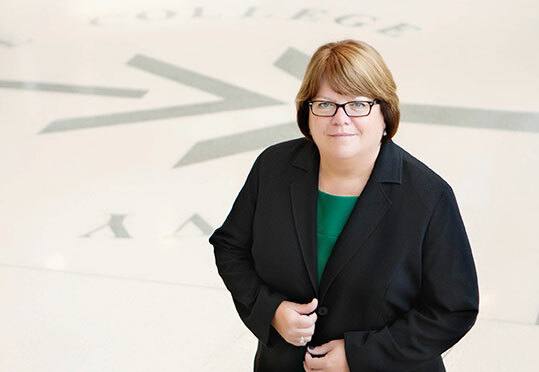 Jennifer A. Vaughan (Jennie) was appointed Chancellor of Ivy Tech Community College’s Bloomington campus on May 1, 2014. She has been an employee of Ivy Tech Bloomington for over 20 years. Prior to being named Chancellor, Vaughan served in a variety of roles including Vice Chancellor for Student Affairs and Executive Director of Human Resources. Vaughan has more than 30 years of experience in higher education, beginning her career as Registrar and Director of Operations at the University of San Francisco. She currently serves on numerous community boards, including the Greater Bloomington Chamber of Commerce, Bloomington Economic Development Corporation, Community Foundation of Bloomington and Monroe County, Bloom Magazine Advisory Board, IU Health Bloomington Hospital Board, The City of Bloomington Redevelopment Commission and Regional Opportunities Initiatives Board of Directors. Vaughan earned a Master’s degree in Public Administration from American Public University, as well as completed graduate course work toward a Master of Arts in Education at the University of San Francisco. She earned a Bachelor’s degree in Organizational Behavior from the University of San Francisco. Ivy Tech Community College’s Bloomington campus board of trustees meetings will be held bi-monthly in 2019, on the fourth Tuesday of the month (except for May and November), from 4 p.m. to 5 p.m. in the Executive Board Room on Ivy Tech’s main campus located at 200 Daniels Way on the west side.